Guatemala is not known as a tropical, beach paradise where people can enjoy a relaxed swim at the sea. And that is exactly what makes it paradise for adventurers and surfers. Paredon is one of those beaches that is starting to become a favorite among surfers because of the breaks. I was able to find the perfect place to stay during our Guatemalan beach adventure. If you ever decide to hit the beaches on the Pacific Coast of Guatemala you will notice that most have waves that are too high and super strong riptide. That’s why these beaches are not seen as a place for families to visit, hang out and swim. But at the same time these very things have made the Guatemalan coast popular among surfers. At first I thought it was crazy that these sort of beaches could be so fun. But now I know that they are one of the many beautiful things about Guatemala. The Pacific coast offers fantastic waves and breaks that most surfers would die to ride. This also opens the possibilities for other fun water sports such as skim boarding, boogie boarding. Even a quick dip in the ocean can be an adventure here. This is basically every adventurous kid’s paradise. 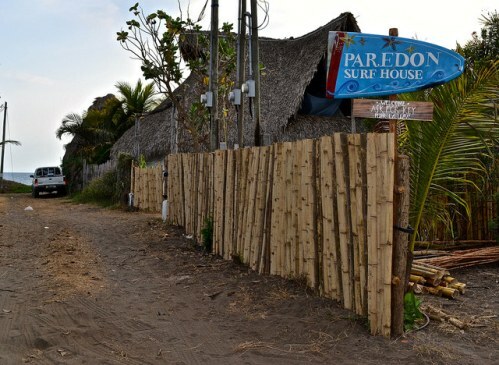 El Paredon in Guatemala and its surf breaks are still not well known among travelers…..yet. But I have the feeling that once more people start noticing them, the surrounding beaches will be packed. Paredon is an extremely small beach town located approximately two hours away from both Antigua and Guatemala City. It is really easy to get there via the highway. However, the last few miles when you get near the town can be quite an adventure off the big highway. Just a couple of minutes after you get off from the main highway you will find the small sand road that will take you to the town. Don’t be frightened by it. The roads may look rural, but they are totally safe and add to the laid back ambiance and charm of the place. Few people have heard about Paredon Beach and even fewer have been adventurous enough to make it a place to share with others. This is how Paredon Surf House started. This hotel is located right on the beach. Pretty much the whole town looks like it is made of sand. Talk about endless summer. It looks like there is beach everywhere! 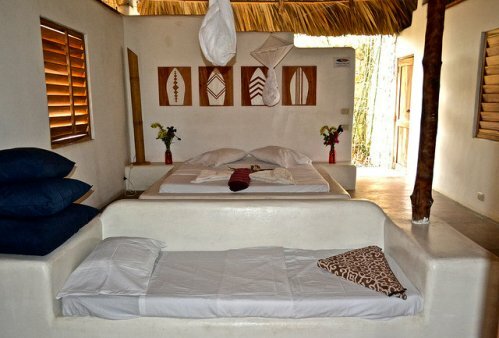 For my family, I decided to get one of the suites at the Paredon Surf House. It was a perfect fit and came with a queen sized bed and two individual sized beds where my boys slept. The coolest part of this suite was the bathroom. It was opened air. They also had two floor casitas. The second floor on these casitas overlook the ocean. But these were always super busy. It was impossible for me to score one of those for the dates I had set for this trip. If you’d like to book one, plan well in advance. If you are traveling solo you can also stay in their dorm which is an open air area with views of the ocean. If, on the other hand, you are traveling with a partner, the resort also offers open air bungalows.In my humble opinion, the best views of all were the ones from the bungalows. However, there is a down side in the case of bungalows and dorms. You have to share bathrooms. The casitas and suites have private bathrooms. • Surfing – They rent surf boards and offer lessons. Paredon’s village is still a tiny place hidden away from the reach of touristic industry so you won’t find formal restaurants offering decent food. That’s why most of the lodges in the area have their own kitchen. 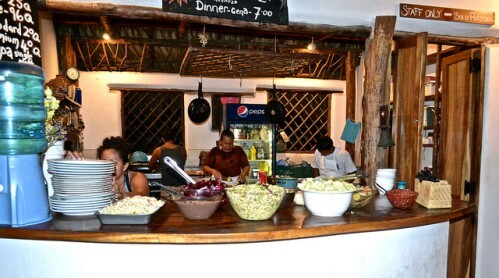 Paredon’s Surf House’s kitchen is open for breakfast, lunch and dinner. However, when the kitchen is closed you can’t get any food! My advice is to pack a lot of snacks because there is a good five hour wait between lunch and dinner. One thing I really liked was the diner format. It is in a family kind of style, so you don’t get to order from a menu. This means that you get tons of food. Recommendation – Because it is a small kitchen and cooks aren’t super fast, it can take up to an hour for you to get your food. As long as you know this and order early, this shouldn’t be an issue. 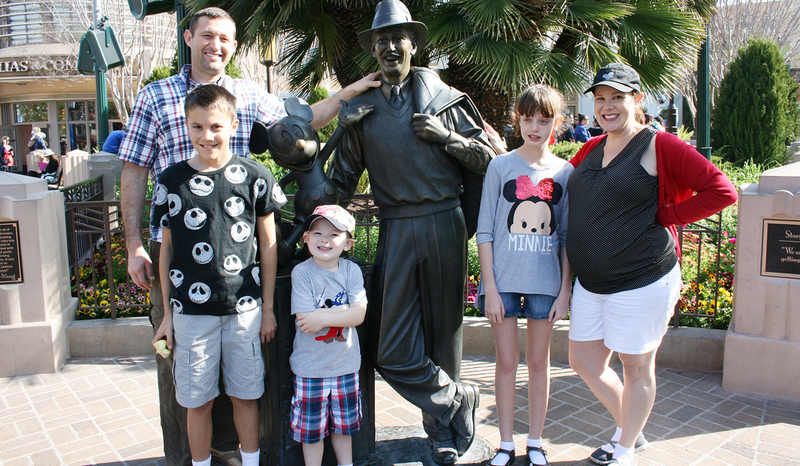 For us it felt extra long because we weren’t aware of this and the kids were hungry, and they let us know it! The prices are extremely affordable, almost too low. And portions are large. • In 2008 two surfing buddies, James and Christoph, built the surf house. • In 2010 they decided to make it a weekend surf camp and guest house. This is when the pool was built. They also included two beachfront bungalows. • Quickly after that, the word got out and another partner, Mathias, joined them. • With Mathias’s help, two more bungalows as well as two sea view suites were built. • They support the community by offering jobs to the locals and buying as much as they can locally. • They also started educating the community about recycling and waste management. • In the last couple of years they built the Casitas for larger parties. Hi! We are travelling to Guatemala for a wedding with my 11 and 12 year-old boys, They are crazy about surfing and found this surf camp El Paredon. Would you recommend it for kids? We are going in July, which falls into the higher waves season. It’s a great spot, it’s ahotel, there are several tiny surf schools there, the town is teeny tiny. It’s not close to Guatemala City or Antigua about 3 hours away. We are planning on staying for 4 days, and then straight to the airport. I just wanted to make sure that waves were safe for the boys, and the schools were used to intermediate surfers of such young age. It will really help to know about your experience.